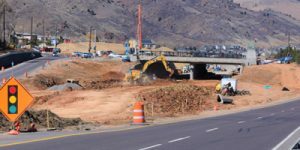 US Highway 6 and 19th Street Interchange – Martinez Associates, Inc.
Martinez Associates was retained by the city of Golden to provide geotechnical engineering services on the project. 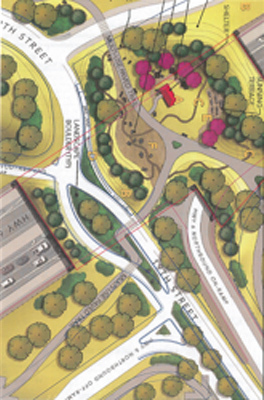 The project is located in Golden, Colorado and consisted of the renovation of the US 6 and 19th Street intersection. The project includes a grade separation that will put US 6 underneath a 19th Street overpass along with a pedestrian and bicycle crossing. The project is the first of its kind in the state in which the bridge structure includes large lid area that will serve as a park above US 6. The project is one of the Responsible Acceleration of Maintenance and Partnerships, or RAMP, projects approved by the CDOT’s transportation commission in October 2013. Martinez is the project geotechnical engineer. The site is located in an area of steeply dipping Pierre Shale bedrock. The geotechnical investigations consisted of over 40 borings and Martinez provided geotechnical design recommendations for bridge structure, retaining walls, and preliminary pavement design criteria. CDOT is providing $20 million toward the project, the city of Golden is putting up $4 million and the Colorado School of Mines is paying $1 million. Martinez was actively involved throughout the design of the project with close collaboration between the client and shareholders.